Whenever you buy something, you enter into a contract. For a contract to exist, you have to offer to buy something, the seller has to accept your offer, and something of value has to be exchanged.Lawyers refer to these "elements" (essential parts) of a contract as an "offer", "acceptance", and "consideration". 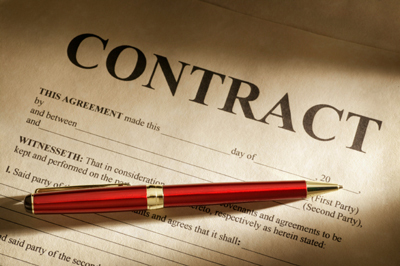 Contracts are a regular part of our everyday lives. For example, suppose you decide that you want to buy a new t-shirt.You go to the store and bring a t-shirt to the clerk. The clerk scans a tag-on the t-shirt and both of you see a price of $20. You take a $20 bill from your wallet and place it on the counter (this is the offer). The clerk takes the money (this is the acceptance) and gives you the t-shirt (this is the consideration – a $20 bill exchanged for a t-shirt). The clerk also hands you a receipt. The receipt "memorializes" (is proof) of the contract, but it is not required to have a valid contract. This transaction represents a contractual relationship between the buyer (you) and the seller (the store). This contract was for a "good" (a physical object) – the t-shirt. A contract can also be for a "service" (where someone does something for you). An example of a service is when you pay someone to change the oil in your car. Contracts can be for both goods and services. For example, when you go to your car mechanic and pay for motor oil and for them to change the oil in your car. The law is different depending on when there is a problem with a good or a service. When possible it is best to memorialize (write out) your contracts. A written contract can help you if there is a problem after the transaction. If there is a problem, a judge can read a written contract to determine what you and the other person agreed to. A judge will usually place greater weight on what is written in the contract, then what each person says. A “binding” contract is an agreement that you sign in writing. The courts are able to enforce binding contracts if someone (or the company) doesn’t live up to their side of the agreement. You cannot enter into a binding contract if you are under 19 years old. People have to sign binding contracts for many of the goods and services they buy, such as a cell phone, gym membership, and cable service. You should know what you are getting into before you sign any contract. Shop around. Understand exactly what each company is offering. The more you know, the more you can negotiate. Compare price, guarantee or warranty, how long the contract is for and any other terms or conditions that are important to you. Know who you're dealing with. Reputation is important, so ask friends or family for references. If you are not sure about a company's reputation check with the Better Business Bureau. Negotiate. Most contracts can be negotiated. Use the information you gathered while shopping around to get the best service and price. Don't feel pressured to sign immediately – if the company or individual wants your business, they will listen to your concerns. Read the contract and pay attention to the details. Make sure any verbal agreements or claims made by the salesperson are written into the contract. Cross-out any parts that you do not want to agree with, and have these changes initialled by you and the salesperson before you sign. Fill all blank spaces so that details cannot be added later by the salesperson. Understand everything in the contract. Ask the salesperson questions and get advice if there are parts that you don't understand. Don't forget that the fine print is part of the contract too. You can have a lawyer review the contract if you feel you need to. Know who to call for help or make a complaint. Ask the salesperson for a customer service phone number and the steps to take if you need to make a complaint. Remember that a signed contract is a legal document, so you will have to live with what you agreed to. Generally, a contract cannot be changed or broken unless you and the other party both agree. Know how to get out of it. Usually, a short period of time is allowed to cancel a contract without penalty; it's called the "cooling off period" and it should be described in the contract. Even if it isn't, you might still have a cooling off period. Contact Consumer Protection BC to find out what the cooling off period might be for your situation. To cancel a contract before it is over, both sides have to agree, but usually it will cost you. Sleep on it. Is this what you really need and want? It's okay to change your mind before signing or agreeing to a contract. Once it's signed, get a copy and keep it. You may need it later on for reference, or to launch a complaint if you have a problem.